Norco's Range bikes, featuring 27.5-inch wheels, 160 millimeters of Horst-Link rear travel fed through generous wheelbases and middlin' slack 66-degree head angles, are aimed straight at that burly trail/climbable all-mountain market segment that these days might as well be labeled 'enduroville.' Enduroville requires bikes long enough, slack enough and beefy enough to prevail in the terrain favored by the downhiller's retirement community, yet still climb competently enough for the thousands of feet of uphill often separating the downs. Our test Range C 7.2 features a carbon-fiber front triangle and seatstays with aluminum chainstays and rocker link. Component spec utilizes a SRAM X1 drivetrain, SRAM Guide brakes, a RockShox Pike RC Solo Air fork paired with RockShox Monarch Plus RC3 shock, a RockShox Reverb Stealth dropper post and a pair of Sun Helix Ringlé 27 hoops shod with Maxxis' ubiquitous and deservedly well-praised High Roller II tires. If the steep and burly intentions of the bike were in any doubt, capping the cockpit with an oversized Race Face Atlas 50-mil stem and 800-millimeter-wide handlebars punctuates that intent clearly. Here is a bike designed to be thrown into, at and off whatever appears in front of it. VERNON FELTON: The chainstays on the Range are 16.8 inches and yet you still have room for big tires and a front derailleur. That's impressive. How'd you manage it? CHRIS COOK: A.R.T. Suspension's rearward axle path and clever frame design. VF: How important is having a short rear center to the purpose of this bike? CC: It's more about designing the right balance between front and rear center, which is important to make the Range handle the way it does. Gravity Tune ensures this balance is the same for all frame sizes by keeping the ratio of front center to rear center the same for all frame sizes. VF: Some people look at the Advanced Ride Technology (A.R.T.) suspension design and would say, "That's just another FSR, Horst Link design." I've ridden both designs and have always noticed that A.R.T. 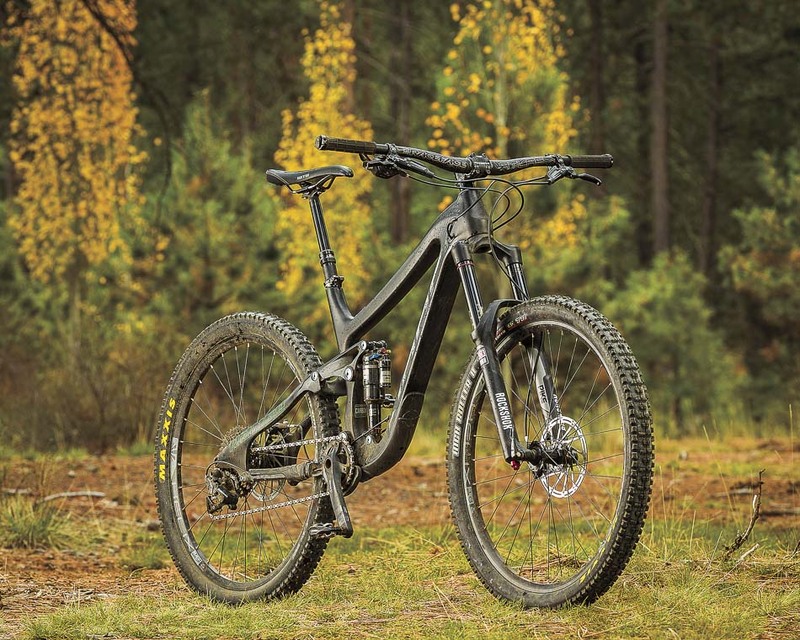 seems more efficient, even when run with the shock wide open, than most Specialized designs (comparing bikes that are relatively apples to apples, like the Enduro and Range). What sets your design apart from other, seemingly similar suspension designs? CC: A.R.T. Suspension's axle path is more rearward than most of our competitors', which results in more anti-squat in the suspension, preventing the chassis from bobbing under pedaling loads. VF: Seemingly stupid question, but here goes: what sets your bike apart from some of the other bikes in the AM/Enduro niche? CC: A bunch of things, including where we love to ride and test our bikes. The terrain we ride can be hard to get to and often unforgiving and coupled with feedback from our athletes through our integrated race development program, we can continue to learn and further develop the design of our bikes. Norco Bicycles’ proprietary technologies, Advanced Ride Technology (A.R.T.) and Gravity Tune, provide the significant difference for the Range. Through A.R.T., we are able to optimize the rear suspension for the specific intended use of the bike. This includes increased rearward axle-path and subsequently chain growth for improved pedaling efficiency, traction, square-edge bump compliance and overall performance that define the Norco ride quality for this intended use. Secondly, Gravity Tune offers all sizes of riders an optimized weight distribution over the bike’s suspension. We are able to modify the front and rear centers proportionally to ensure that every rider has the best bike possible for their individual proportions. VF: Who's the ideal rider for the Range? CC: The Range is highly accomplished at speed on technical descents, while enabling the rider to climb efficiently and smoothly to earn the top of every trail. The ideal Range rider is someone who loves to get out there for the descents, while being deeply passionate about earning their turns. There is a resolve, a spirit of adventure to go whenever and wherever they need to, and find that spot on the map. They love the outdoors and probably have a(nother) multi-day hut-to-hut ride with friends on their list. Sound like anyone you know…?